June 13, 2013 | 8 a.m.
Hilary Ritchie ’13 gave the senior reflection during the 12:30 p.m. commencement ceremony on May 25. 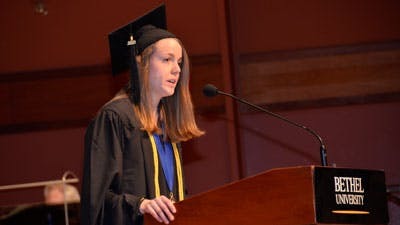 A senior reflection presented by Hilary Ritchie during the 12:30 p.m. commencement ceremony on May 25 for the College of Arts & Sciences at Bethel University. Ritchie graduated this spring with a Bachelor of Arts in history and biblical and theological studies. Good afternoon! My name is Hilary Ritchie, and I am graduating with a degree in history and biblical and theological studies. I’d like to thank the president’s office, my parents and friends, and my professors in both the history and biblical and theological studies departments for their investment in me during these past four years at Bethel. In Luke 14:7-11, Jesus shares a Sabbath meal with the religious leaders. Noticing their behavior at the party, Jesus tells them a story of a man who goes to a party and sits at the head of the table, then is asked to move to the foot of the table. In this honor-based culture, this would have heaped shame on the man. What advice does Jesus give? When you’re a guest, you should seek the lowest place. That way the host might come by and ask you to move to a place of higher distinction, thus giving you more honor. 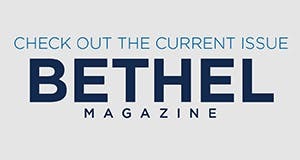 Jesus ends his parable by saying, “Those who exalt themselves will be humbled, and those who humble themselves will be exalted.” As graduates of Bethel University, we also ought not to seek the place of honor, but of humility. Humility may seem like an unlikely topic for a graduation message, but in the end, I think as Christ-followers, humility should be what we pursue after life at Bethel. True humility must come from a denial of entitlement. True humility must come from our very core. Since we live in the shadow of the cross and the light of the resurrection, we realize that, because of the grace of Christ, we have no right to our lives. A mindset of entitlement can be an easy trap to fall into, especially as we reflect on all of our achievements. We have worked hard to get to this point—stayed up late studying, driven far and wide for internships, and wrestled with difficult ideas. As Christians, though, we hold our achievements with an open hand, knowing that God is their author. I came into Bethel with an attitude of entitlement, but toward the end of my sophomore year and into my junior year, I realized the need in my life to set aside this entitlement. I was a good student, in a position of leadership, and investing in meaningful relationships. I was looking forward to the perfect living situation junior year, and a continuation of the ideal Bethel life I had (rightfully, in my mind) led up until that point. Junior year came, and I was in a different living situation than what I first wanted, and I felt like some of my friendships were falling apart. At first, I was resentful that God would place me in such a situation. But as junior year progressed, God strengthened new relationships, helped me see that His plan was better, and taught me to grow in humility. As we move forward from Bethel, let us continue to let go of entitlement, knowing that God is in control and He is using us for His work. This parable clearly teaches that we should not seek earthly approval. This comes from fixing our vision on Jesus, who is in Himself the ultimate example of humble service, not seeking to please those in power, but serving even unto death. We too, must live to serve, content to be found doing the tasks that the world might consider insignificant, but that God uses for His kingdom. As Christians, we are able to find fulfillment in the fact that we know Christ, who empowers us to do significant things for Him even in seemingly insignificant positions by the world’s standards. As we leave Bethel, we can serve God wherever He’s placed us: in an office job, working at a coffee shop, or cleaning bathrooms. We are freed from the burden of needing to appear to be something. We are found in Christ, so no matter where we find ourselves, God has work for us to do for His kingdom. It may be big. It may be small, but He is calling us to something, and His is the voice that we should listen to. Jesus’ story ends with an exhortation: “All who exalt themselves will be humbled, and all who humble themselves will be exalted.” The only truly Exalted One is Jesus Christ, at the right hand of God. As we seek humility, we also are exalted so that the truth of His kingdom might go forth. In the story in Luke 14, Jesus says that when we are moved up at the table, we are “honored in the presence of all who sit with [us].” The honor is not for ourselves. The honor actually benefits others. Think about the people who have impacted you the most—the people who have gotten you to this point in Benson Great Hall. Your list may include parents, coaches, teachers, roommates, camp counselors, pastors, friends. These are the people who are humble and obedient in the ordinary, everyday life to which God has called them. God may be calling a few of you to the places of earthly honor. If you obtain such honor, remember that your true place is at the foot of the table. In the end, what we must remember is that the dinner party in the parable is ultimately not evenabout the guest of honor. It is about the host. God will exalt us, but He will exalt us to be used for His purposes. We may receive earthly recognition. We may not. Either way, God is still the center of the story, a story that He has been crafting since before the world began—and you are a part of that story. Congratulations, Bethel University class of 2013!